There is a local aphorism that Malaysia has some of the best policies in the world, but our problem lies in the implementation. And when it comes to the diet and health of Malaysians, we can all see the problem steadily ballooning up in front of our eyes. While there are many statistics to back this up, the simple fact that we hold the title of Asia’s fattest nation should be telling enough. And so, the Food-Environment Policy Index (Food-EPI) research team set out to do the necessary: evaluating and benchmarking the implementation of our current food policies against international standards. According to the team’s principal investigator, Prof Dr Tilakavati Karupaiah, an unhealthy diet causes the highest amount of disease burden (in the form of disability-adjusted life years, or DALYs) when it comes to diet-related non-communicable diseases (NCDs) like heart disease, diabetes and cancer. This includes eating less than the recommended amount of wholegrains, fruits and vegetables, nuts and seeds, and omega-3 fatty acid-rich seafood, as well as consuming more than the recommended levels of salt and sugar-sweetened drinks. In terms of tackling this problem, she says: “The conventional approach is to tackle the individual in terms of behavioural changes – targeting, and essentially resting the burden on the individual to change to eat healthily. The experienced dietitian and nutritionist explains that a healthy food environment enables and instigates the individual to voluntarily make healthier food choices. “The environment becomes a big factor that can motivate the individual to change,” she says. The findings were evaluated by an independent panel of 26 experts representing health, allied health and consumer non-governmental organisations (NGOs), and academia. The panel also evaluated and prioritised recommendations of actions to close the gaps in policy implementation. When benchmarked against international best practices, Malaysia landed squarely in the middle – we were neither excellent (over 75% implementation rates) nor horrible (less than 25%). Sixty-two percent of our food policies had low (26%-50%) implementation rates, and 38%, medium (51%-75%) implementation rates. 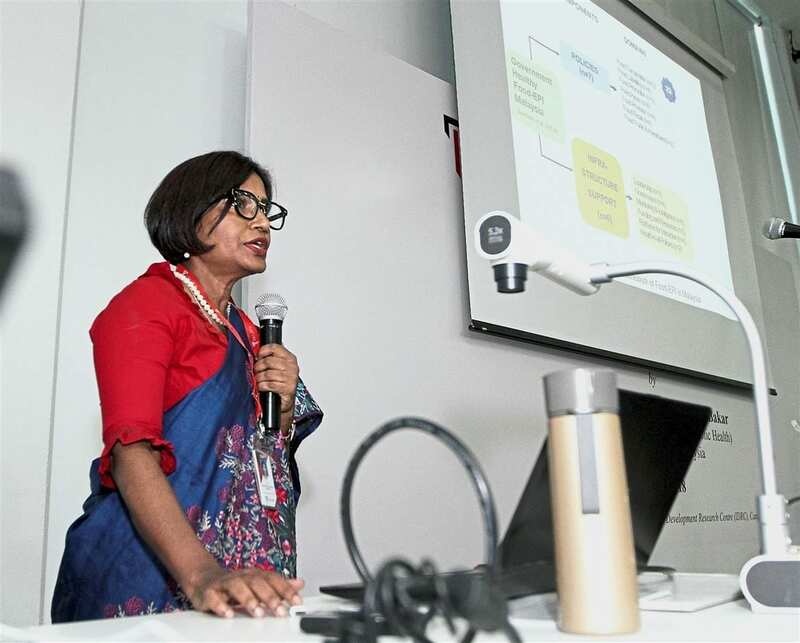 During the technical report presentation held at Taylor’s University, Subang Jaya, recently, Prof Tilakavati highlighted the areas that had the highest and lowest scores within each component. For policy, food labelling, specifically ingredient lists/nutrient declarations, had the highest score, while food promotion, specifically restricting promotion of unhealthy foods in children’s settings (e.g. schools), scored the lowest. She explains that in Malaysia, mandatory food labelling for energy, carbohydrates, protein and fat is required by the Food Regulations 1985 act. This also includes total sugars for ready-to-drink beverages and more specific details when a nutrition claim is made, e.g. listing the percentage of different types of fat when the food makes a claim about its fat content. The ingredients of the packaged food also have to be declared in descending order of proportion by weight, i.e. the first ingredient listed forms the highest proportion of the food, and the last ingredient, the least. In addition, there are plans to draft regulations to add on mandatory labelling of sodium (salt) and total sugars on these ingredient labels. 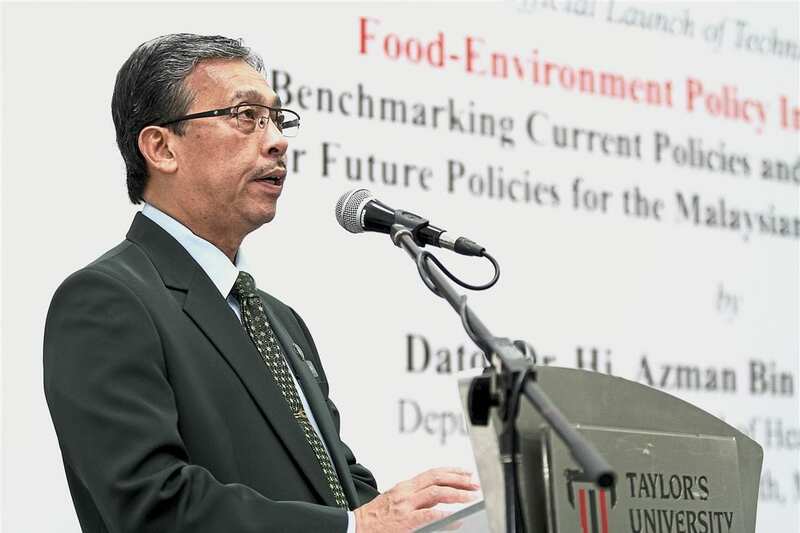 Dr Azman says that the Food-EPI is a good framework in which to evaluate the implementation of our food policy. Despite its score, the expert panel identified a few areas where our food labelling could be improved. “The advice was to (one,) include added sugar, rather than total sugar, along with sodium and saturated fat in nutrient declarations. “Two, to expand food labelling to other food types (aside from packaged foods). “And further, the most important, there is a lack of verification on what goes on the label, which requires enforcement and monitoring on nutrition labelling – there is no process in place to check that,” says Prof Tilakavati. Meanwhile, there is no law against the promotion of unhealthy foods in children’s settings in Malaysia. The exception is a clause in the Code of Ethics for the Marketing of Infant Food and Related Products that prohibits direct or indirect incentives to childcare centres for promoting infant formula. This is in contrast to the examples of Hungary, Spain, Uruguay and Chile given by Prof Tilakavati, which have specific laws prohibiting the advertising and marketing of unhealthy foods to children. “Along with that, we have the Malaysian Pledge 2013 – it’s a voluntary commitment – that there will be no communication related to products in primary schools, except where specifically requested or agreed by school administration for educational or informational purposes. “And plans are to enforce banning of unhealthy food or beverage marketing to children within 50m of the perimeter of schools,” she says. Restricting food advertising targeting children through mandatory law and children-specific nutrient criteria. Developing rules and guidelines for health promotion or sponsorship deals in schools to avoid the commercial promotion of unhealthy foods. Monitoring children’s exposure to such promotion and investigating the effects of a mandatory regulatory approach. 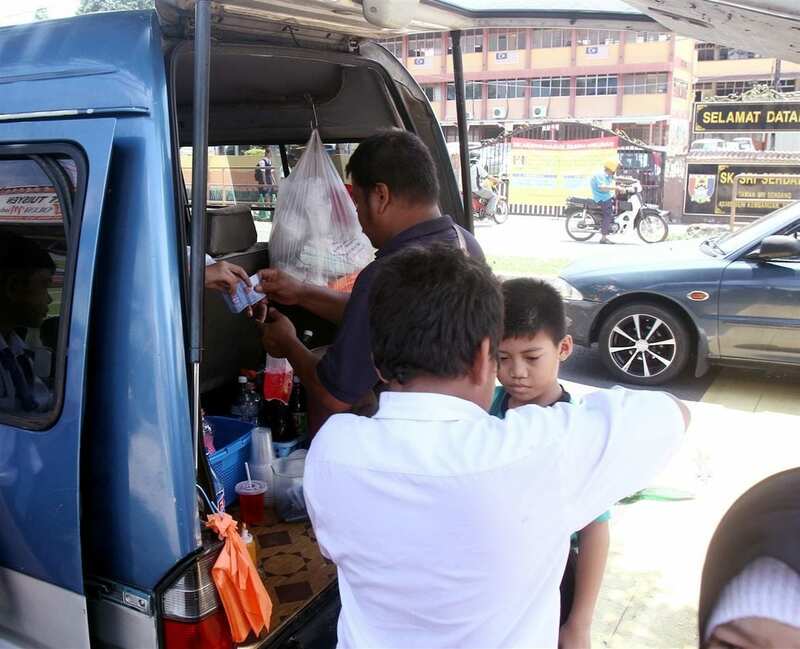 While the national policy is to restrict the promotion of unhealthy foods in childrens settings, street vendors selling junk food and sugary drinks outside schools are not uncommon, as seen in this filepic. 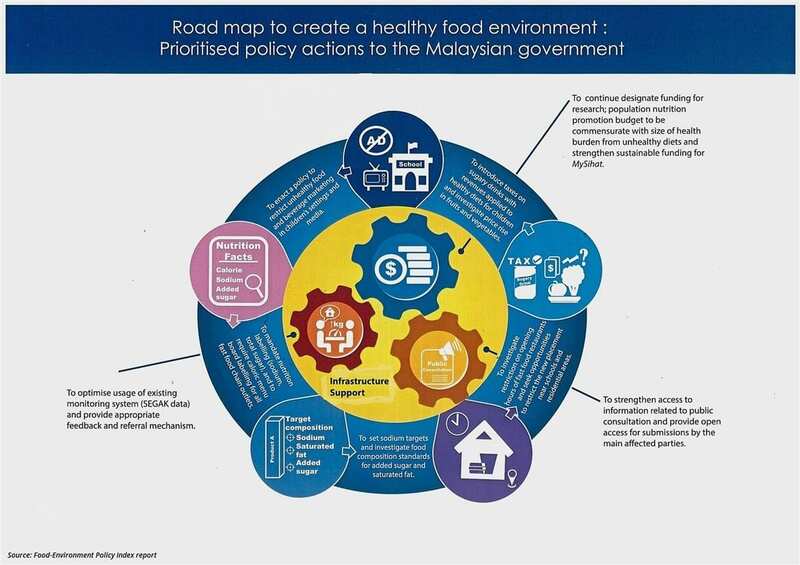 For infrastructure support, the highest score went to implementation of food-based dietary guidelines under the leadership category, while the lowest score went to funding and resources for the national health promotion agency, the Malaysian Health Promotion Board (MySihat). 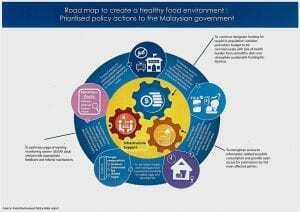 “In Malaysia, the Malaysian Dietary Guidelines (MDG), including for children and adolescents, have been available. “They are centred around the Malaysia Food Pyramid, as well as the newer Malaysian Healthy Plate, which is a visual tool to illustrate the proportion of food groups using quarter and half portions,” says Prof Tilakavati. She adds that the Government plans to review the MDG once every 10 years and to develop dietary guidelines for other special groups like pregnant and lactating women, the elderly and vegetarians. However, the experts expressed their reservations with the effectiveness of these measures, noting that the food targets are open to interpretation and that it is challenging to get the public to understand and practise the MDG in their daily diet. Meanwhile, the benchmark for funding and resources for our health promotion agency was the Victorian Health Promotion Foundation (VicHealth). Prof Tilakavati explains that VicHealth, which was established in 1987, was funded for its first 10 years with revenue from a tobacco tax and continues to enjoy support from all political parties in Australia’s state of Victoria. “They are very strong and they are quoted around the globe for the excellent work they are doing for health promotion,” she says. “What about us? The Malaysian Health Promotion Board, MySihat, is a statutory board under the Malaysian Health Promotion Board Act 2006. According to the expert panel review, however, the board’s funding is insecure, and therefore, it is ineffective due to lack of funds. Altogether, there were 32 policy action recommendations given by the expert panel to help close the gaps in food policy implementation. The Food-EPI team then scored each recommendation in terms of achievability and importance. There were five each for policy and infrastructure support that were deemed both achievable and important. For policy, the top two actions involved the marketing and advertising of unhealthy food and beverages targeting children. The first is to come up with a policy governing such marketing in children’s settings, while the second is to create regulations to restrict such advertising in the broadcast media. The third is to require all fast food chain outlets to have calorie labelling on their menu boards, and to promote this in other food outlets, e.g. mamak stalls. The last two target salt and sugar, with one recommendation to set sodium targets for selected food groups and the other to introduce a tax on sugary drinks, with the monies going to promote healthy diets for children. Meanwhile, research, funding and information availability are the focus of the five recommendations for infrastructure support. The first recommendation is to continue prioritising research on reducing obesity and diet-related NCDs through the various Government funding mechanisms. Also related to funding, the next two actions are to increase nutrition promotion funding so that it commensurates with the burden of population unhealthiness from unhealthy diets, and to strengthen the funding for MySihat so that it can become more effective. The last two recommendations concentrate on information availability. One is to ensure that data from the National Physical Fitness Standard (Segak), which collects data like height and weight from children aged 10 to 17, is properly disseminated to schools and parents for further action. The other is to strengthen public access, including for NGOs, academia and the industry, to food policy information. However, he adds: “It is very important that you had it done this way, although it’s quite tedious with its bureaucratic red tape. “But it’s very important if you’re talking about wanting the buy-in from the policymakers across the ministries. This, he says, is a good time to present these findings to the Government, and hopefully, initiate the recommended changes.